Maryland's charter of 1632 granted the Calverts land north of the entire length of the Potomac River up to the 40th parallel. A problem arose when Charles II granted a charter for Pennsylvania in 1681. The grant defined Pennsylvania's southern border as identical to Maryland's northern border, but described it differently, as Charles relied on an inaccurate map. The terms of the grant clearly indicate that Charles II and William Penn believed the 40th parallel would intersect the Twelve-Mile Circle around New Castle, Delaware, when in fact it falls north of the original boundaries of the City of Philadelphia, the site of which Penn had already selected for his colony's capital city. Negotiations ensued after the problem was discovered in 1681. A compromise proposed by Charles II in 1682, which might have resolved the issue, was undermined by Penn receiving the additional grant of the "Three Lower Counties" along Delaware Bay, which later became the Delaware Colony, a satellite of Pennsylvania. Maryland considered these lands part of its original grant. Progress was made after a Court of Chancery ruling affirming the 1732 agreement, but the issue remained unresolved until Frederick Calvert, 6th Baron Baltimore ceased contesting the claims on the Maryland side and accepted the earlier agreements. Maryland's border with Delaware was to be based on the Transpeninsular Line and the Twelve-Mile Circle around New Castle. The Pennsylvania–Maryland border was defined as the line of latitude 15 miles (24 km) south of the southernmost house in Philadelphia (on what is today South Street). As part of the settlement, the Penns and Calverts commissioned the English team of Charles Mason and Jeremiah Dixon to survey the newly established boundaries between the Province of Pennsylvania, the Province of Maryland, and Delaware Colony. In 1779, Pennsylvania and Virginia agreed "To extend Mason's and Dixon's line, due west, five degrees of longitude, to be computed from the river Delaware, for the southern boundary of Pennsylvania, and that a meridian, drawn from the western extremity thereof to the northern limit of the said state, be the western boundary of Pennsylvania for ever." After Pennsylvania abolished slavery in 1781, the western part of this line and the Ohio River became a border between slave and free states, with Delaware retaining slavery until the Thirteenth Amendment was ratified in 1865. 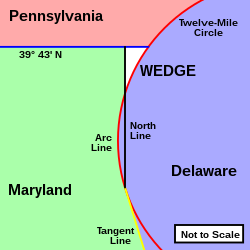 Diagram of the survey lines creating the Mason–Dixon line and "The Wedge"
The surveyors also fixed the boundary between Delaware and Pennsylvania and the approximately north-south portion of the boundary between Delaware and Maryland. Most of the Delaware–Pennsylvania boundary is an arc, and the Delaware–Maryland boundary does not run truly north-south because it was intended to bisect the Delmarva Peninsula rather than follow a meridian. The Maryland–Pennsylvania boundary is an east-west line with an approximate mean latitude of 39°43′20″ N (Datum WGS 84). In reality, the east-west Mason–Dixon line is not a true line in the geometric sense, but is instead a series of many adjoining line segments, following a path between latitude 39°43′15″ N and 39°43′23″ N.
The surveyors also extended the boundary line 40 miles (64 km) west of Maryland's western boundary, into territory that was still in dispute between Pennsylvania and Virginia, though this was contrary to their original charter. Mason and Dixon's survey was finished on October 9, 1767, about 31 miles (50 km) east of what is now Pennsylvania's southwest corner. In 1774, commissioners from Pennsylvania and Virginia met to negotiate their boundary, which at the time involved Pennsylvania's southern border west of Maryland and its entire western border. Both sides agreed that Pennsylvania's grant made its western border a tracing of the course of the Delaware River, displaced five degrees to the west. And both sides thought this would place Fort Pitt in Virginia territory (in fact it would not have). With that in mind, the governor of Pennsylvania argued that, despite the agreement reached with Maryland, Pennsylvania's southern border west of Maryland was still the 39th parallel, about 50 miles (80 km) south of the Mason–Dixon line. Negotiations continued for five years, with a series of proposed lines. In the end, a compromise was reached: the Mason–Dixon line would be extended west to a point five degrees west of the Delaware River. To compensate Pennsylvania for the claimed territory lost, its western boundary would be run due north rather than copying the course of the Delaware River. 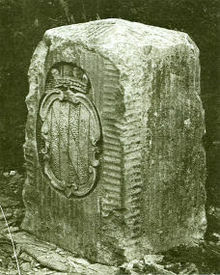 The Mason–Dixon line was marked by stones every mile and "crownstones" every 5 miles (8.0 km), using stone shipped from England. The Maryland side says "(M)" and the Delaware and Pennsylvania sides say "(P)". Crownstones include the two coats of arms. Today, while a number of the original stones are missing or buried, many are still visible, resting on public land and protected by iron cages. The line was established to end a boundary dispute between the British colonies of Maryland and Pennsylvania/Delaware. Maryland had been granted the territory north of the Potomac River up to the fortieth parallel. Pennsylvania's grant defined the colony's southern boundary as following a 12-mile (radius) circle (19 km) counter-clockwise from the Delaware River until it hit "the beginning of the fortieth degree of Northern latitude." From there the boundary was to follow the fortieth parallel due west for five degrees of longitude. But the fortieth parallel does not, in fact, intersect the 12-mile circle, instead lying significantly farther north. Thus Pennsylvania's southern boundary as defined in its charter was contradictory and unclear. The most serious problem was that the Maryland claim would put Philadelphia, the major city in Pennsylvania, within Maryland. The disputants engaged an expert British team, astronomer Charles Mason and surveyor Jeremiah Dixon, to survey what became known as the Mason–Dixon line. It cost the Calverts of Maryland and the Penns of Pennsylvania £3,512 9/– (9 shillings 0 pence) to have 244 miles (393 km) surveyed with such accuracy. To them the money was well spent, for in a new country there was no other way of establishing ownership. In April 1765, Mason and Dixon began their survey of the more famous Maryland–Pennsylvania line. They were commissioned to run it for a distance of five degrees of longitude west from the Delaware River, fixing the western boundary of Pennsylvania (see the entry for Yohogania County). However, in October 1767, at Dunkard Creek near Mount Morris, Pennsylvania, nearly 244 miles (393 km) west of the Delaware, their Iroquois guides refused to go any further, having reached the border of their lands with the Lenape, with whom they were engaged in hostilities. As such the group was forced to quit, and on October 11, they made their final observations, 233 miles (375 km) from their starting point. In 1784, surveyors David Rittenhouse and Andrew Ellicott and their crew completed the survey of the Mason–Dixon line to the southwest corner of Pennsylvania, five degrees from the Delaware River. Other surveyors continued west to the Ohio River. The section of the line between the southwestern corner of Pennsylvania and the river is the county line between Marshall and Wetzel counties, West Virginia. The Mason–Dixon line has been resurveyed three times: in 1849, 1900, and in the 1960s. On November 14, 1963, during the bicentennial of the Mason–Dixon line, U.S. President John F. Kennedy opened a newly completed section of Interstate 95 where it crossed the Maryland–Delaware border. It was one of his last public appearances before his assassination in Dallas, Texas. The Delaware Turnpike and the Maryland portion of the new road were later designated as the John F. Kennedy Memorial Highway. Mason and Dixon could only do the work as accurately as they did due to the work of Nevil Maskelyne, some of whose instruments they used. There was keen interest in their work and much communication between the surveyors, Maskelyne and other members of the British Scientific establishment in the Royal Society in Britain, notably Henry Cavendish. During such survey work, it is normal to survey from point to point along the line and then survey back to the starting point, where if there were no errors the origin and re-surveyed position would coincide. Normally the return errors would be random – i.e. the return survey errors compared to the intermediate points back to the start point would be spatially randomly distributed around the start point. Mason and Dixon found that there were larger than expected systematic errors, i.e. non-random errors, that led the return survey consistently being in one direction away from the starting point. When this information got back to the Royal Society members, Henry Cavendish realised that this may have been due to the gravitational pull of the Allegheny Mountains deflecting the theodolite plumb-bobs and spirit levels. Maskelyne then proposed measuring the gravitational force causing this deflection induced by the pull of a nearby mountain upon a plumb-bob in 1772 and sent Mason (who had returned to England) on a site survey through central England and Scotland to find a suitable location during the summer of 1773. Mason selected Schiehallion at which to conduct what became known as the Schiehallion experiment, which was carried out primarily by Maskelyne and determined the density of the Scottish mountain. Several years later Cavendish used a very sensitive torsion balance to carry out the Cavendish experiment and determine the average density of Earth. Mason and Dixon likely never heard the phrase, "Mason–Dixon line". The official report on the survey, issued in 1768, did not even mention their names. While the term was used occasionally in the decades following the survey, it came into popular use when the Missouri Compromise named "Mason and Dixon's line" as part of the boundary between slave territory and free territory. In popular usage to people from the Northern United States, the Mason–Dixon line symbolizes a cultural boundary between the North and the South (Dixie). However, for many people who identify as Southern, Maryland is not considered a Southern state, leading to confusion over terminology (for more on Maryland's position as southern or northern, see the Region section of the article on Dixie). Originally "Mason and Dixon's Line" referred to the border between Pennsylvania and Maryland. After Pennsylvania abolished slavery, it served as a demarcation line for the legality of slavery. That demarcation did not extend beyond Pennsylvania because Delaware, then a slave state, extended north and east of the boundary. Also lying north and east of the boundary was New Jersey, where slavery was formally abolished in 1846, but former slaves continued to be "apprenticed" to their masters until the passage of the Thirteenth Amendment to the United States Constitution in 1865. The Missouri Compromise line (Parallel 36°30′ north) had a much clearer geographic connection to slavery in the United States leading up to the Civil War. Mason "The Line" Dixon is a leading character in Rocky Balboa (2006), the sixth film in the Rocky franchise, directed by and starring Sylvester Stallone. Played by real-life boxer Antonio Tarver, Dixon is the current World Heavyweight Boxing Champion who is ridiculed for having never fought a real contender, and who thus agrees to an exhibition fight against the nearly 60-year-old Rocky Balboa. In Attack of the Killer Tomatoes, Mason Dixon is the leader of a government task force dedicated to stopping the worldwide crisis when tomatoes turn malignant. The line makes several appearances in the 1953 Bugs Bunny cartoon "Southern Fried Rabbit". The line separates the drought affected North from which the "Yankee" Bugs leaves in search of carrots in the green lands of the "Dixie" south, the latter being guarded by Yosemite Sam. Mason & Dixon (1997) is the title of a novel by American author Thomas Pynchon. The novel meanders widely through the lives of Mason and Dixon, traditional American history, and other themes such as hollow earth theory, geomancy, deism, and – perhaps – alien abduction. The 1918 song, "Rock-a-Bye Your Baby with a Dixie Melody", written by Jean Schwartz and popularized by Al Jolson, includes the lyric Just hang my cradle, Mammy mine/ Right on that Mason–Dixon Line. A small group of musicians from Paul Whiteman's orchestra led by C melody saxophonist Frank Trumbauer and including Bix Beiderbecke recorded two sides for Columbia on May 15, 1929 titled, "Alabammy Snow" and "What A Day!" under the pseudonym, "Mason–Dixon Orchestra". It is probable that they chose this pseudonym because the catalog number of the record would be 1861-D, 1861 being the year that the American Civil War began. The Mason–Dixon line provides the main narrative for the song "Sailing to Philadelphia" (featuring James Taylor) by British singer-songwriter and guitarist Mark Knopfler. The 1955 song, "Hey, Porter", by Johnny Cash makes reference to the Mason–Dixon line in the line, How much longer will it be until we cross that Mason-Dixon line? In the regional baseball rivalry between the New York Yankees and the Boston Red Sox, the theoretical border that separates population centers that are majority-Red Sox fans from majority-Yankees fans in Connecticut is sometimes called the "Munson-Nixon Line", in a reference to the Mason–Dixon line. Credited to Steve Rushin of Sports Illustrated, the line is named for famed Yankee catcher Thurman Munson and Red Sox right fielder Trot Nixon. ^ a b Davies, R.D (1985). "A Commemoration of Maskelyne at Schiehallion". Quarterly Journal of the Royal Astronomical Society. 26 (3): 289–294. Bibcode:1985QJRAS..26..289D. ^ Maskelyne, Nevil (January 1, 1775). "An account of observations made on the mountain Schehallien for finding its attraction". Philosophical Transactions of the Royal Society of London. London. 65: 500–542. doi:10.1098/rstl.1775.0050. Retrieved January 5, 2011. Accordingly Mr. Charles Mason, who had been employed on several astronomical occasions by the Royal Society, was appointed to make a tour through the Highlands of Scotland in the summer of the year 1773, taking notice of the principal hills in England which lay in his route either in his going or in his return. ^ John Mackenzie, "A brief history of the Mason–Dixon Line", APEC/CANR, University of Delaware; accessed 2017.01.05. ^ "An Act to provide a temporary Government for the Territory of Colorado" (PDF). Thirty-sixth United States Congress. February 28, 1861. Retrieved February 22, 2007.